It's a little over a month after the iOS version, but the BBC's dedicated Sports app has today made it onto Google Play. 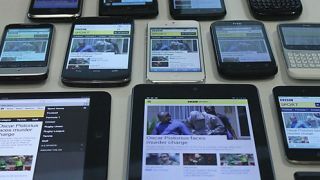 The free mobile app has been designed to play nicely with screen sizes all the way up to 7-inch tablets, meaning you 10-inch owners may not get the best experience. It'll work with all versions of Android from 2.2 (Froyo) onwards. If you're still languishing on Eclair then it may be time to consider upgrading. Like the iOS app before it, the Android app brings sporting news, live scores, commentary and analysis as well as live and on-demand video because, let's face it, seeing sport happen is much more exciting than just reading about it. The video and audio features may require you to download the BBC's Media Player app too, depending on your handset. Keith Mitchell, BBC Sport's mobile technical lead, let slip that a couple of additional features are coming soon to the app: "These include customisable quick links for the main navigation, team customisation and home screen widgets." So if you thought it was all over… you were wrong. Out now on Google Play, the BBC Sport Android app will also be heading to Amazon's app marketplace in the near future.